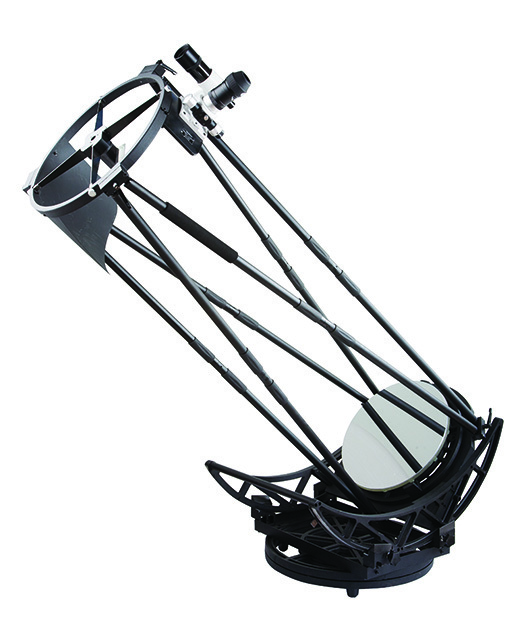 Today I have the pleasure of reviewing new to our shores, Sky-Watcher’s first 18-inch f4 truss style Dobsonian. There have been many rumors and talk about if and when Sky-Watcher would release a telescope of this size. For those who know the Sky-Watcher Flex Tube Dobsonian Line, you will notice straight away that this is a totally different concept. You might recall this style of the telescope from other leading brands, but as Skywatcher do so well, they have produced a telescope, that not only performs extremely well, but also is very affordable. It’s an open design that has allowed for the telescope to be completely dismantled, allowing for transportation in any small car. Setup or Disassembly could be easily done within 20mins with use. You could easily fit this scope in your Toyota hatch. Once setup, this scope will definitely be a draw card for any astronomy shows. Each truss tubes are 30mm thick, and give a very strong support and structure, stopping any shift in collimation. The tubes are individually numbered helping with correct assembly each time. They are held in position by a quick release clamp, allowing for easy assembly and no need for extra tools. The base is strongly made, and finished off with a smart black look. The whole telescope rotates and pivots on four Teflon runners. There are two locking screws on the side. This stops any vertical movement and is a nice little feature for if you don’t intend on disassembling the telescope. Parabolic Primary Pyrex mirror. If you’re a previous sky-Watcher owner, you will know what amazing results these can produce. With 18 inches of light collection, it will be even better. Now you’re probably thinking it’s going to be heavy, but they have made it extremely thin, however still strong as ever. They are using the same three collimating screws as their other models underneath the base of the mirror, each with its own locking screw. At the center of the mirror is a small white 10mm dot helping with collimation. I was able to test the 18 inch a few days ago, and it was easily collimated straight out of the box. Even after shipping all the way from Synta. The secondary is 130mm by 180mm in diameter. It’s a quite large, but l don’t believe it will reduce any light hitting primary mirror. You might need to invest in a secondary dew heater. After 4 hours of viewing in 5 degrees temperatures, dew was starting. The primary was fine, but for those in minus temps, it might be a good option to not hinder any viewing nights. Sky-Watcher has stayed with their Crayford-style 10:1 focuser, with 1 1/4 and 2-inch size eyepieces abled to be used. The focal length is 1900mm. I’m 6.2ft, and there was no way I could reach the eyepiece at zenith. You are going to need a small ladder. There is a small light shroud opposite to the eyepiece stopping any stray light coming in. However, I believe a complete light shroud is needed, to stop any stray light coming in. Obsession produces a shroud that has a protective cardboard surrounding the lower half. This will stop anything dropping onto the mirror. For those interested, if they can take Argo Navis kits, I’m unsure at this stage, but I believe they can be fitted. The total weight assembled is 50kg. However, the heaviest part when needing to transport is only 12kg. You don’t have to be physically fit to setup the scope, like the 16 inch GoTo. Skywatcher have once again proven themselves in the astronomy community, and if you’re looking for an 18 inch telescope, that doesn’t cost the price of a house deposit this one might be for you.